York to teach classes and workshops. Teaching fee info. 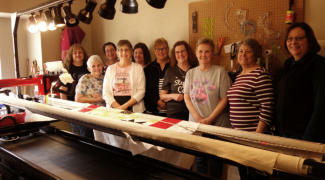 Private One-on-One Classes at DQS Studio: Longarm Learning Block A private, one-on-one, longarm classes with Joyce. Longarm learning blocks are customized with content to answer your questions and meet your specific needs. From basics to more advanced techniques, longarm or computer guided, write down your goals and schedule a block of time for hands-on learning. Longarm Learning Block Fee: $35 per hour (minimum of two hours, plus materials) Call 585-226-2577 to schedule your Longarm Learning Block. 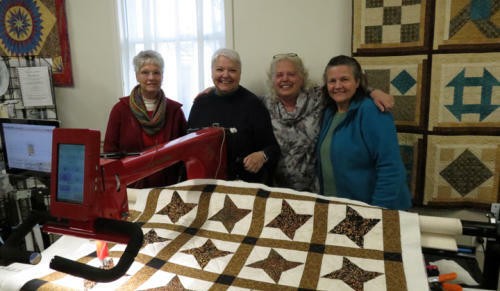 Group Classes at DQS Studio: (New Group Classes schedule will be posted in January 2019) Longarm Prep Class - Interactive Lab - Required Class to Rent Time, 2 hours Group Class Fee: $35, Private Class $50 This class if for those wanting to learn more about longarm quilting, try out a longarm, and is required before renting time on our Nolting longarms to quilt your own quilt. This prep class includes demonstrations, instruction and hands-on with tips and techniques for a successful longarm experience. You will learn how to use the machines, frame, and equipment, how to prepare your quilt for longarm quilting, and the basics of longarm quilting. Bring a notebook. Quilting Pantos Successfully - Interactive Lab - 3 hours Class Fee: Group $55, Private $95 Pantographs offer quilters a way of stitching an overall pattern that is balanced and looks beautiful. Quilting pantos also builds a quilters muscle memory as they repeat the five “moves” of longarm quilting. This class covers how to set up a panto, how to successfully center and align the panto to the quilt top, how to work with both squared off and interlocking patterns, how to set up to stitch the first, move from one row to the next when advancing the quilt, and quilting the last row. Following the techniques and tips in the class, every panto will be stitched out beaurifully. Methods in this class work with all brands of machines and frames. Bring a notebook. Free Motion Quilting - Techniques and Ideas - 1 person per machine, 3 hours Class Fee: Group $65, Private $95 This class explores a number of marking methods, how to choose thread, teaches techniques for successful free motion quilting, and gives the student an opportunity to try stitching different techniques suitable for all over quilting, blocks, sashings and borders. You will take your sample home. Methods work with all brands of machines and frames. Bring a notebook. Using Templates and Rulers - Techniques, Tips & Ideas - 1 person per machine, 3 hours Class Fee: Group $65, Private $95 Templates and rulers offer the quilter the opportunity to expand their design options and give order and precision to quilting not possible with FMQ. The class teaches the correct techniques for using templates and rulers, offers many design ideas, and gives ample time for hands-on practice with templates from our wide selection. You will take your sample home. Methods work with all brands of machines and frames. Bring a notebook. Feathers - Yes! You Can - 1 person per machine, 3 hours Class Fee: Group $65, Private $95 Feathers are beautiful quilted on all types of quilts from traditional to modern. Don’t shy away from quilting feathers. Learn how to quilt feathers in this class with no-fail techniques. You will soon be having fun quilting feathers in blocks, sashings, and borders. You will take your sample home. Methods work with all brands of machines and frames. Bring a notebook. 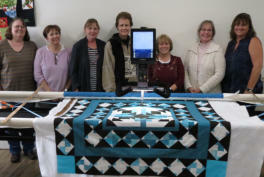 Computer Guided Workshops Quiltmagine Fee: Two day workshop $275, One day workshop $175 (minimum required) Workshops are usually one or two days, entry level through intermediate plus. The workshop is hands on using the QM tablet. Participants build skill and confidence. If a Nolting longarm/commercial frame and Quiltmagine is available, we stitch out projects that we work on in class, usually on a small quilt. IntelliQuilter Fee: Two day workshop $275, One day workshop $175 (minimum required) Workshops are usually one or two days entry level and beyond with the many fun and useful techniques and editing functions found in IQ. The workshop is hands-on using the IQ tablet. Participants build skill and confidence. If a frame with IQ is available, we are able to learn more of the advanced features of IQ and will stitch out techniques, usually on a small quilt. Register today for a longarm class. Techniques apply to all longarm brands. Select button below to register for longarm classes scheduled above. 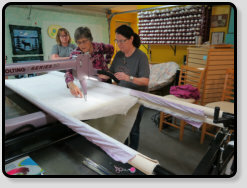 Private One-on-One Classes at DQS Studio: Longarm Learning Block A private, one-on-one, longarm classes with Joyce. Joyce has years of experience teaching, years of experience and knowledge in the techniques and mechanics of longarm quilting as well as trouble shooting longarm problems, and has written the book, “ Guide to Quilting with Your Nolting ,” Longarm learning blocks are customized with content to answer your questions and meet your specific needs. Longarm Learning Block Fee: $25 per hour (minimum of two hours, plus materials) Call Joyce for more information and to schedule your Longarm Learning Block, 585-226- 2577. Group Classes at DQS Studio: (New Group Classes schedule will be posted in January.) Longarm Prep Class - Interactive Lab - Required Class to Rent Time, 2 hours Class Fee: $35 This prep class includes demonstrations, instruction and hands-on with tips and techniques for a successful longarm experience. You will learn how to use the machines, frame, and equipment, how to prepare your quilt for longarm quilting, and the basics of longarm quilting. Bring a notebook. Quilting Pantos Successfully - Interactive Lab - 3 hours Class Fee: $50 Pantographs offer quilters a way of stitching an overall pattern that is balanced and looks beautiful. Quilting pantos also builds a quilters muscle memory as they repeat the five “moves” of longarm quilting. This class covers how to set up a panto, how to successfully center and align the panto to the quilt top, how to work with both squared off and interlocking patterns, how to set up to stitch the first, move from one row to the next when advancing the quilt, and quilting the last row. Following the techniques and tips in the class, every panto will be stitched out beaurifully. Methods in this class work with all brands of machines and frames. Bring a notebook. Free Motion Quilting - Techniques and Ideas - 1 person per machine, 3 hours Class Fee: $65 This class explores a number of marking methods, how to choose thread, teaches techniques for successful free motion quilting, and gives the student an opportunity to try stitching different techniques suitable for all over quilting, blocks, sashings and borders. You will take your sample home. Methods work with all brands of machines and frames. Bring a notebook. Using Templates and Rulers - Techniques, Tips & Ideas - 1 person per machine, 3 hours Class Fee: $65 Templates and rulers offer the quilter the opportunity to expand their design options and give order and precision to quilting not possible with FMQ. The class teaches the correct techniques for using templates and rulers, offers many design ideas, and gives ample time for hands-on practice with templates from our wide selection. You will take your sample home. Methods work with all brands of machines and frames. Bring a notebook. Feathers - Yes! You Can - 1 person per machine, 3 hours Class Fee: $65 Feathers are beautiful quilted on all types of quilts from traditional to modern. Don’t shy away from quilting feathers. Learn how to quilt feathers in this class with no- fail techniques. You will soon be having fun quilting feathers in blocks, sashings, and borders. You will take your sample home. Methods work with all brands of machines and frames. Bring a notebook. Computer Guided Workshops Call us to schedule a workshop at your shop or studio. Quiltmagine Fee: Two day workshop $275, One day workshop $150 (minimum required) Workshops are usually one or two days, entry level through intermediate plus. The workshop is hands on using the QM tablet. Participants build skill and confidence. If a Nolting longarm/commercial frame and Quiltmagine is available, we stitch out projects that we work on in class, usually on a small quilt. IntelliQuilter Fee: Two day workshop $275, One day workshop $150 (minimum required) Workshops are usually one or two days entry level and beyond with the many fun and useful techniques and editing functions found in IQ. The workshop is hands-on using the IQ tablet. Participants build skill and confidence. If a frame with IQ is available, we are able to learn more of the advanced features of IQ and will stitch out techniques, usually on a small quilt.